A full understanding of God’s plan of the ages must include a study of the Old Testament prophets and their writings. Habakkuk and Zephaniah give interesting insights into God’s past dealings with his people and His plans for their future. Habakkuk, ministering during the last days of Judah’s kingdom, finds the answers to some important questions that most believers wrestle with at some time in their Christian experience. Does God wink at the sins of his people? How can a righteous God use wicked people to chasten a less wicked people? God answers these two questions of Habakkuk. His answer to the first question is this: God does not overlook the sins of His people. He is even then preparing to judge their sin at the hands of the Chaldeans. God’s answer to the second question is as follows: God does use wicked agents to chasten His people, but these wicked agents will eventually be punished if they selfishly or excessively chastise God’s people. Habakkuk, having found the answers to his questions, then rests at peace and says in his heart, “Yet I will rejoice in the Lord, I will joy in the God of my salvation,” Hab. 3:18. Zephaniah, a contemporary of Habakkuk, also sees the soon-coming downfall of Judah. He becomes a preacher of woe, warning the nation concerning their sins and calling them to repentance. Knowing that they will not positively respond, he warns of the coming captivity but does not leave them without hope for he prophesies to them a glorious future for the remnant of Judah. 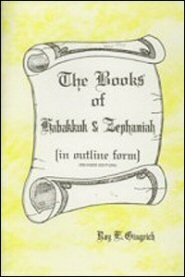 Dr. Roy Gingrich, the author of this outline commentary, has done a very commendable piece of work in analyzing and outlining the books of Habakkuk and Zephaniah. Bible students will find Dr. Gingrich’s commentary to be of great help in the understanding of these two prophetical books. They will be profitably exercised in the reading of this book.